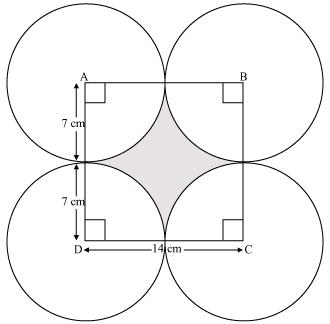 NCERT Solutions for Class 10 Math Chapter 12 Areas Related To Circles are provided here with simple step-by-step explanations. These solutions for Areas Related To Circles are extremely popular among class 10 students for Math Areas Related To Circles Solutions come handy for quickly completing your homework and preparing for exams. All questions and answers from the NCERT Book of class 10 Math Chapter 12 are provided here for you for free. You will also love the ad-free experience on Meritnation’s NCERT Solutions. All NCERT Solutions for class 10 Math are prepared by experts and are 100% accurate. The radii of two circles are 19 cm and 9 cm respectively. Find the radius of the circle which has circumference equal to the sum of the circumferences of the two circles. Let the radius of 3rd circle be r.
Therefore, the radius of the circle which has circumference equal to the sum of the circumference of the given two circles is 28 cm. 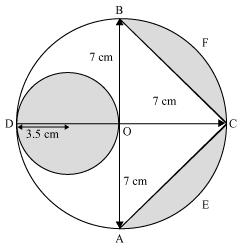 The radii of two circles are 8 cm and 6 cm respectively. Find the radius of the circle having area equal to the sum of the areas of the two circles. However, the radius cannot be negative. Therefore, the radius of the circle having area equal to the sum of the areas of the two circles is 10 cm. 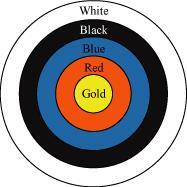 Given figure depicts an archery target marked with its five scoring areas from the centre outwards as Gold, Red, Blue, Black and White. The diameter of the region representing Gold score is 21 cm and each of the other bands is 10.5 cm wide. Find the area of each of the five scoring regions. Given that each circle is 10.5 cm wider than the previous circle. 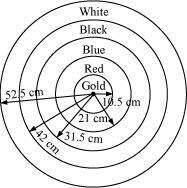 Therefore, areas of gold, red, blue, black, and white regions are 346.5 cm2, 1039.5 cm2, 1732.5 cm2, 2425.5 cm2, and 3118.5 cm2 respectively. The wheels of a car are of diameter 80 cm each. How many complete revolutions does each wheel make in 10 minutes when the car is traveling at a speed of 66 km per hour? Let the number of revolutions of the wheel of the car be n.
Therefore, each wheel of the car will make 4375 revolutions. Let the radius of the circle be r.
Given that, the circumference of the circle and the area of the circle are equal. Therefore, the radius of the circle is 2 units. Find the area of a sector of a circle with radius 6 cm if angle of the sector is 60°. 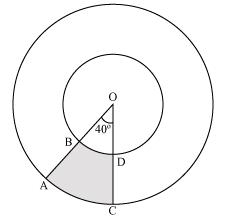 Let OACB be a sector of the circle making 60° angle at centre O of the circle. Find the area of a quadrant of a circle whose circumference is 22 cm. Quadrant of circle will subtend 90° angle at the centre of the circle. The length of the minute hand of a clock is 14 cm. Find the area swept by the minute hand in 5 minutes. We know that in 1 hour (i.e., 60 minutes), the minute hand rotates 360°. Therefore, the area swept by the minute hand in 5 minutes will be the area of a sector of 30° in a circle of 14 cm radius. Let AB be the chord of the circle subtending 90° angle at centre O of the circle. 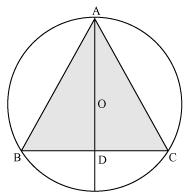 Therefore, ΔOAB is an equilateral triangle. A chord of a circle of radius 15 cm subtends an angle of 60° at the centre. 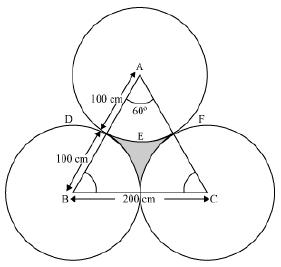 Find the areas of the corresponding minor and major segments of the circle. ΔOPQ is an equilateral triangle. A chord of a circle of radius 12 cm subtends an angle of 120° at the centre. 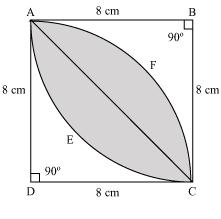 Find the area of the corresponding segment of the circle. Let us draw a perpendicular OV on chord ST. It will bisect the chord ST.
(i) The area of that part of the field in which the horse can graze. 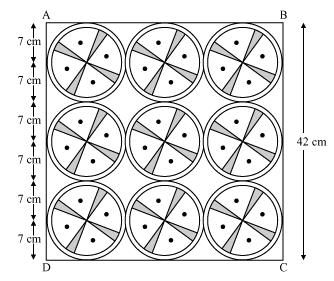 (ii) The increase in the grazing area of the rope were 10 m long instead of 5 m.
From the figure, it can be observed that the horse can graze a sector of 90° in a circle of 5 m radius. A brooch is made with silver wire in the form of a circle with diameter 35 mm. The wire is also used in making 5 diameters which divide the circle into 10 equal sectors as shown in figure. Find. (i) The total length of the silver wire required. Total length of wire required will be the length of 5 diameters and the circumference of the brooch. It can be observed from the figure that each of 10 sectors of the circle is subtending 36° at the centre of the circle. An umbrella has 8 ribs which are equally spaced (see figure). 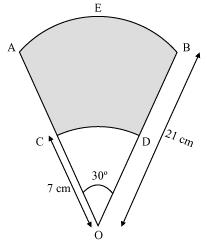 Assuming umbrella to be a flat circle of radius 45 cm, find the area between the two consecutive ribs of the umbrella. There are 8 ribs in an umbrella. The area between two consecutive ribs is subtending at the centre of the assumed flat circle. A car has two wipers which do not overlap. Each wiper has blade of length 25 cm sweeping through an angle of 115°. Find the total area cleaned at each sweep of the blades. It can be observed from the figure that each blade of wiper will sweep an area of a sector of 115° in a circle of 25 cm radius. sector of 80° in a circle of 16.5 km radius. It can be observed that these designs are segments of the circle. Consider segment APB. Chord AB is a side of the hexagon. Each chord will substitute at the centre of the circle. Therefore, the cost of making such designs is Rs 162.68. Hence, (D) is the correct answer. 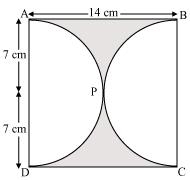 Find the area of the shaded region in the given figure, if PQ = 24 cm, PR = 7 cm and O is the centre of the circle. It can be observed that RQ is the diameter of the circle. Therefore, ∠RPQ will be 90º. 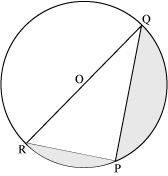 Since RQ is the diameter of the circle, it divides the circle in two equal parts. Find the area of the shaded region in the given figure, if radii of the two concentric circles with centre O are 7 cm and 14 cm respectively and ∠AOC = 40°. 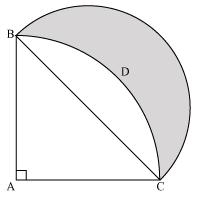 Find the area of the shaded region in the given figure, if ABCD is a square of side 14 cm and APD and BPC are semicircles. It can be observed from the figure that the radius of each semi-circle is 7 cm. 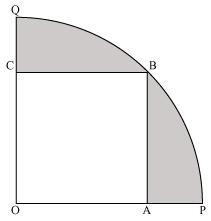 Find the area of the shaded region in the given figure, where a circular arc of radius 6 cm has been drawn with vertex O of an equilateral triangle OAB of side 12 cm as centre. We know that each interior angle of an equilateral triangle is of measure 60°. 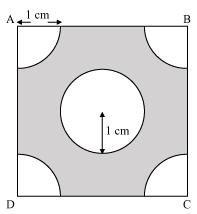 From each corner of a square of side 4 cm a quadrant of a circle of radius 1 cm is cut and also a circle of diameter 2 cm is cut as shown in the given figure. Find the area of the remaining portion of the square. Each quadrant is a sector of 90° in a circle of 1 cm radius. 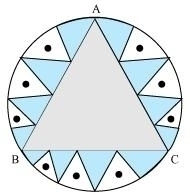 In a circular table cover of radius 32 cm, a design is formed leaving an equilateral triangle ABC in the middle as shown in the given figure. 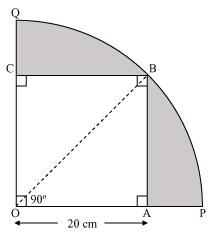 Find the area of the design (Shaded region). AD is the median of ABC. 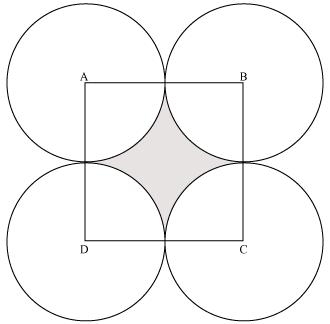 In the given figure, ABCD is a square of side 14 cm. 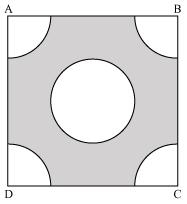 With centres A, B, C and D, four circles are drawn such that each circle touches externally two of the remaining three circles. Find the area of the shaded region. Area of each of the 4 sectors is equal to each other and is a sector of 90° in a circle of 7 cm radius. Therefore, the area of shaded portion is 42 cm2. Thegivenfigure depicts a racing track whose left and right ends are semicircular. Therefore, the area of the track is 4320 m2. 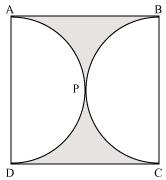 In the given figure, AB and CD are two diameters of a circle (with centre O) perpendicular to each other and OD is the diameter of the smaller circle. 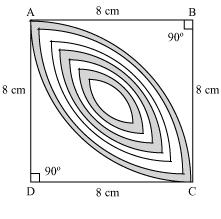 If OA = 7 cm, find the area of the shaded region. Let the side of the equilateral triangle be a. Each sector is of measure 60°. 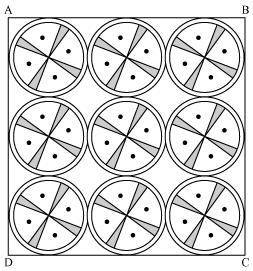 On a square handkerchief, nine circular designs each of radius 7 cm are made (see the given figure). Find the area of the remaining portion of the handkerchief. From the figure, it can be observed that the side of the square is 42 cm. 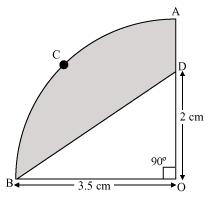 (i) Since OACB is a quadrant, it will subtend 90° angle at O.
AB and CD are respectively arcs of two concentric circles of radii 21 cm and 7 cm and centre O (see the given figure). 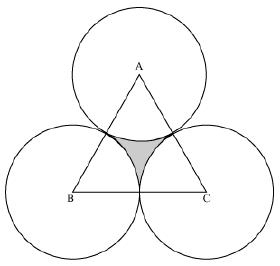 If ∠AOB = 30°, find the area of the shaded region. In the given figure, ABC is a quadrant of a circle of radius 14 cm and a semicircle is drawn with BC as diameter. Find the area of the shaded region. 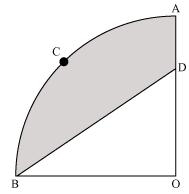 As ABC is a quadrant of the circle, ∠BAC will be of measure 90º. 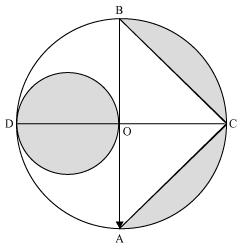 Calculate the area of the designed region in the given figure common between the two quadrants of circles of radius 8 cm each. The designed area is the common region between two sectors BAEC and DAFC.